Nevíte jestli bude "létatelná" RIO pozice s tím že bude na pilot pozici AI? In this video we explorer the F-14 Tomcat's unique features it also has some interesting flight characteristics, discuss some of the basics of flying that will help you keep the tomcat happy in flight, and show you some tricks so that you can keep the plane in control and don't find yourself in an awkward flight departure. Ten manuál na Tomcata vyzerá naaaaaaramne. Kedy vlastne bude F14 dostupná? Jo, o tom manuálu mluvili už v době vydání prvního videa o předprodeji. Jedná se o online formu manuálu, která díky tomu, že je online, může být aktualizována v reálném čase. To je, imho, zase usili utracene na nespravnem miste. Jak to vytisknout, aby to mohlo slouzit v dobe, kdy jsem ve hre v kabine? Mimo to, treba blackshark mel manual o tridu lepsi uz pred lety a koneckoncu natops pro F-14 ma kolem tisice stranek, takze tech kolik - padesat? zdaleka neni nejaka nova latka. Nevim, nakolik to bylo mysleno ironicky, protoze "vybirani" flatspinu je vystrelit se ven, ale vybirani vyvrtky na F-14 fakt nevymyslis, jsou k tomu (ve skutecnosti) tri stranky husteho textu, par obrazku a graf, kde je vybrani rozkreslene na desitky vterin. btw, čistě teoreticky, nebylo by dobré zatáhnout jedno křídlo v ploché vývrtce? Nezačal by stroj přepadávat po jednom křídle na čumák? Hu, měl by vyjít manuál i tištěný. Ale za mě, na tohle si beru tablet nebo druhý monitor. PDF planned but no ETA. No, když jsem ten manuál projížděl, tak za mě má moc pěknou strukturu. Hodně se mi líbí odkazy v textu, kdy kliknu na něco, co mě zajímá, a manuál mě automaticky nalistuje stránku s detaily. * JTAC has very short designation range - range is increased. * Added binocular with laser to units that assigned for JTAC task. * BDA setting can be enforced now from server to clients. * AIM-9X: AIs will not use the missile to engage targets well outside the range of the missile. * AGM-65: Missiles launched from sides of Triple Rack will have proper trajectory. * Fixed crash related to BGM-109 Tomahawk usage. * AI’s Su-33 will be able to take off from deck of Kuznetsov with proper weight. * MP Server. Slightly corrected the banned list window. * MP Server. Fixed gradual performance loss when there’s no sound card. * ME. Soldiers added to Abkhazia and South Ossetia. * ME. Added Cuba to country list. * MiG-29A. Added Kazakhstan KazAADF 2008 skin by Asker Askerov. * Radar missile usage crash fixed. * Wingmen air refueling crash fixed. * Ground units - crash on recon mode fixed. * Missile launch warning system crash fixed. * Aircraft Big formations. Crash appearing in case of destruction of the leading flight is fixed. * Fixed crash when switching maps. * Function "onPlayerTryConnect" now send correct message to a client when connection has been refused. * Fixed: NRAS Cannot be entered and does not display NRAS cue. * Fixed: Pitch Caret can not be changed on the ODU. * Fixed pilots' textures showing on 3D mesh. * Fixed collision lines' naming convention. * Fixed MPR power as a function of altitude (MPR doesn't decrease power at high altitude anymore). * Added oil pressure drop when engine damaged. * Added C-101CC engine fire when damaged. * Improved engine failure when damaged. * Rudder, aileron, elevator, horizontal stabilizer, flaps and speed brake flight model damage implemented. * Added engine fire for C-101CC to flight model damages. * Batteries, inverters, generator, starter, engine oil leak, engine fire, hydraulic leak, gunsight lamps flight model damage implemented (WIP). * Fixed wheels damaged collision model. * Added batteries and inverters destruction when the nose detaches. * Added generator destruction when engine section is damaged. * Added aerodynamic drag increase when nose is teared. * Added starter destruction due to engine section damage. * Fixed IFR mission #2, which was broken due to new advanced flight model. * Added failures set in Mission Editor (WIP) for: generator, starter, batteries, inverters, oil pressure drop, fuel leak, engine seized, hydraulic leak, elevator loss, aileron loss, rudder loss, pitot tube blocked, static port blocked and gunsight lamps failure. 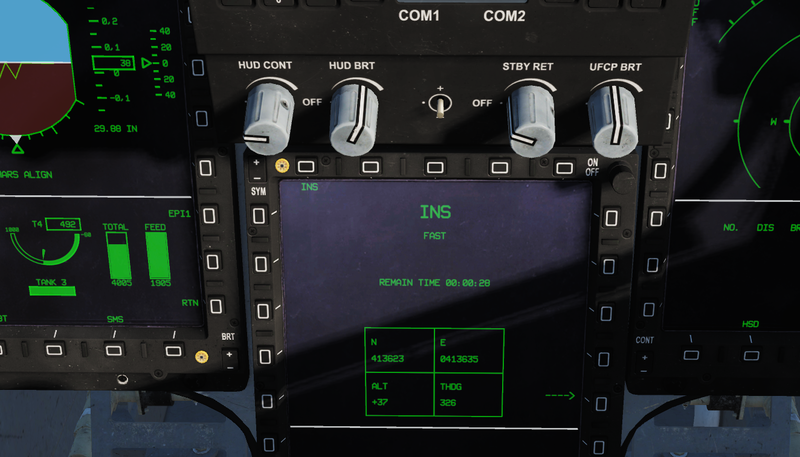 * Front-rear cockpits synchronization in multiplayer: fixed batteries isolation pushbuttons, added essential circuit transfer, added engine anti-ice and engine computer pushbuttons (partially), fixed pitch trim synchronization (partially). * Fixed hydraulic pressure in AFM. It's now zero at cold start and increases/decreases during engine start/stop or crank. * Added PART. METAL. (CHIP DETECT) warning light to C-101EB. * Crank will not work if there is starter failure. * Pilot’s arm patches are not visible when pilot body is not showing. * Rework on aircraft numerals (changed color for Chilean numeral). * Fixed Spanish patches for Matacan and Claex skins. * TOT HUD indicator is reversed - fixed. * When the player selects a different radar azimuth setting, the BRA bearing will not changing. * Added Realistic/Unrealistic TDC Slew option for compensate issue with hardware TDC of the Thrustmaster Warthog. * Fixed High Drag Bomb Fuze Errors. * Fixed some errors in the Early Access Guide. * Spring Tension Campaign:13th miz - Mi-28 doesn't attack targets - fixed. * Cockpit. 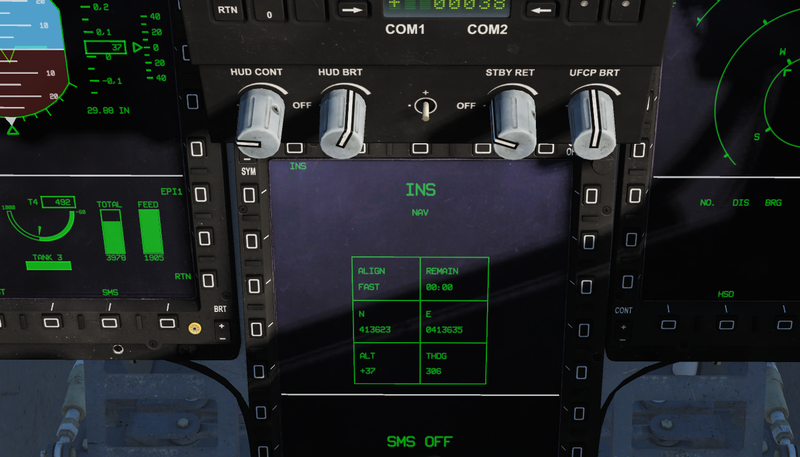 Corrected Pitot heat switch marking. * The glass material of canopy will not be detached from the canopy frame. * Al Dhafra Airbase. Player will able to call the Rearming and refuel panel even from the farthest parking. * F-15C Aggressors BFM Campaign by Mapple Flag. Some minor briefing text updates and unit repositioning. Tak mám nastudovaný kokpit pilota. Ten to má hodně jednoduchý,co se čudlíků týče, protože to za něj dělá všechno RIO. Naučit se RIO podle mě bude větší výzva, než se naučit pilota. BTW v changelogu se píše, že opravili překryt u plivače ohně, Takže hádám, že zpětné zrcátko bude opět rozbité. Krom toho překrytu je vše ostatní neopravené. Jakto? Ještě opravili popisek u přepínače ohřevu pitotovy trubice.